The Deering Estate provides a beautiful, natural setting for a variety of experiences. Enjoy a peaceful visit, view one of our many inspiring art and history exhibits, tour the historic homes, pack a picnic, visit one of our artist in resident studios, or simply take a walk along the boat basin. For the more adventurous visitor, take a guided trail tour of the lush natural areas or enjoy canoe tours, bird and butterfly walks, nite hikes and other specialty tours. Learn more about the indigenous people and natural habitats of Florida as well as the many endangered species that frequent the property. 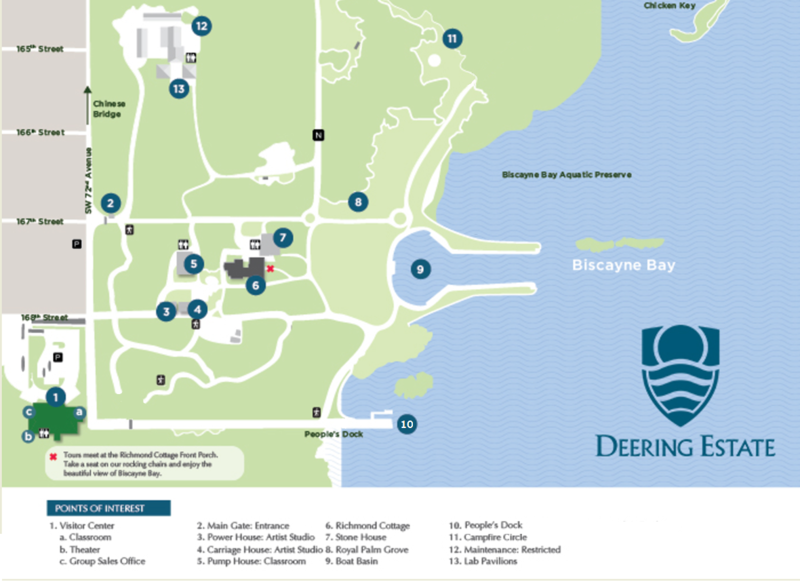 Conveniently located in Miami-Dade County, the Deering Estate is just east of Old Cutler Road and SW 168 Street, accessible via the Florida Turnpike, US-1, and Old Cutler Road. MetroRail to Dadeland South and take MetroBus 1 to SW 168Street or MetroBus 152 to SW 152 Street, then transfer to one of the IBus stops provided by Palmetto Bay that will drop you off at the Visitor Center. Old Cutler Bike Path is a fully paved bike path, a full 11 miles from Coco Plum Circle, bikers can enjoy the scenery of parks including Matheson Hammock and the Deering Estate. 15 miles From Downtown Miami – Take I-95 South to South Dixie Highway; continue south to SW 168th Street. Turn left and travel east. Cross Old Cutler Road and the Visitor’s Center is about ½ block on the right. From the Turnpike – Exit SW 152nd Street East (Coral Reef Drive). Continue east to Old Cutler Road (about 3 miles). Turn right on Old Cutler Road and travel south to SW 168th Street (about 1 mile). Turn left and parking and the Main Gate are available on SW 168 Street and 72 Avenue. We ask our patrons to join us in the stewardship of Deering Estate in order to protect the natural resources and the historic buildings. • Refrain from making loud noises, feeding, harassing, or throwing objects at animals. • Do not pick plants, flowers or climb trees. • Stay on designated pathways. • No flash photography or portrait photo-shoots are permitted inside the historic houses. For personal or professional photo shoots on the grounds of Deering Estate, please obtain a permit wristband upon arrival.